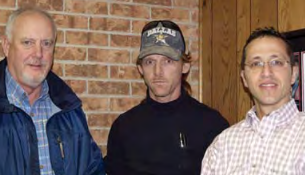 January 31, 2017 - "Applications "
Bluebonnet Feeds in Ardmore, OK in 2007 celebrated its 25th anniversary in business, commemorating the 1982 purchase by a group of Houston, TX retail feed store operators of the shuttered Comet Feeds feed mill in Ardmore. Bluebonnet’s managers did more than just pop a champagne cork or two to celebrate the anniversary, however. The company also undertook a series of major improvements to its feed manufacturing operations in Ardmore. These upgrades allowed the company to shut down its second feed mill in Brownwood, TX, which it had acquired in 2005, and consolidate operations in Ardmore, halfway between Oklahoma City, OK, and Dallas-Fort Worth, TX. 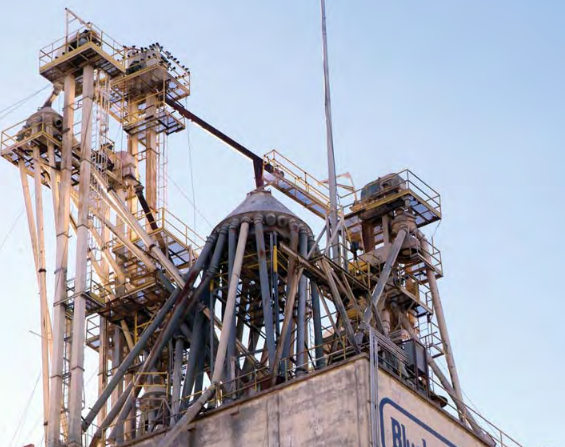 “This puts us in a position to serve our market efficiently,” says President Bill Stuever, who notes that Bluebonnet Feeds ships feeds for multiple species throughout Oklahoma, Texas, Arkansas, Louisiana, New Mexico, and portions of northern Mexico. As a business enterprise, the history of Bluebonnet Feeds actually dates back to 1972, when it began as a retail feed center in Pearland, TX, outside Houston. Over the next 10 years, the company added two more locations in southeast Texas. “We were making a lot of use of Stride brand feed supplement, which was made by Comet Feeds in Ardmore,” says Mark Urbanosky, company founder and currently chief nutritionist. However, Comet Feeds ran into financial difficulties in the early 1980s, and the feed mill shut down, cutting off the supply of Stride supplement. The Texans traveled to Ardmore and negotiated the purchase of the operation in 1982, which was the start of Bluebonnet Feeds. Today, the company produces a full line of feeds for beef cattle, horses, sheep, goats, poultry, rabbits, and some wildlife mixes. The company also produces organic fertilizers and bags grains such as rolled oats and barley. Since 2006, Bluebonnet Feeds has spent about $2.5 million on various upgrades. The most dramatic of these may have been at the end of the manufacturing process with the addition of three Fuji-Ace robotic bag palletizers, sold and installed by Chantland-MHS, Humboldt, IA (515-332-4045). 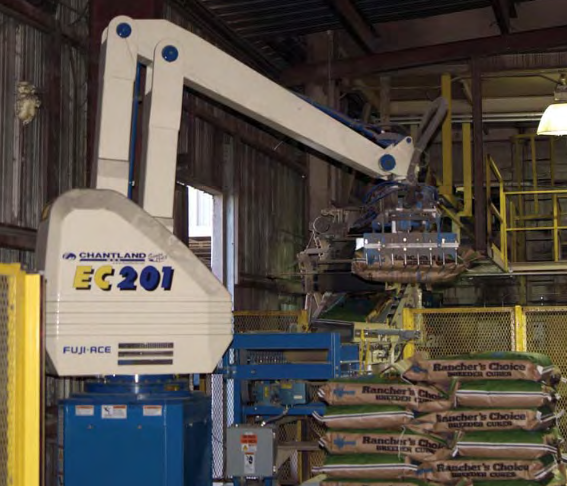 Operations Manager Troy Williams notes that the robots, which are similar to those used in the automotive industry, are capable of stacking 20 to 22 bags of feed per minute. Plans for 2008 call for the addition of two Johnson bagging lines to supplement two existing Inglett lines, he adds. • Installation of a new 5-ton Scott twin-shaft mixer. This state-of-the-art unit is capable of mixing a batch in 45 seconds, though it typically is not run that fast. 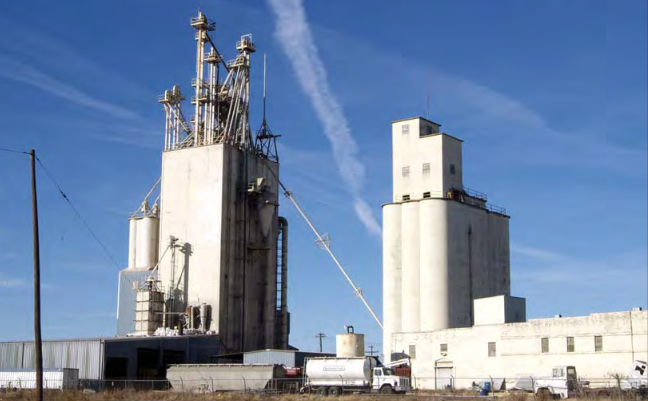 • Replaced seven aging distributors atop the feed mill with four new Hayes & Stolz electronic distributors, with 25 holes on receiving, 10 holes on transfer, eight holes on the roller mill, and four holes on grinding. The system utilizes stainless steel spouting to resist some corrosive ingredients commonly handled at the mill. • Replaced an older cleaner with a new Clipper Conquest scalper-cleaner, which is rated to clean grain en route from the elevator to processing at approximately 1,000 bph. In addition to two new baggers, plans for the next two years call for upgrading the plant’s Beta Raven automation system to handle grain and ingredient receiving in addition to batching, automating some pelleting operations, and the addition of warehouse space for bagged ingredients and finished feeds. Reprinted from the March/April 2008 Issue of Grain Journal.